Yes, metadata is information about your book: but it is the only information your readers have before buying the book. You can spend hundreds of dollars on advertising in vain if your metadata is not compelling enough. Your title, description (and your cover) are your best tools of engaging readers and get them to buy your book. It would be a mistake to disregard these tools. Even the most amazing book can go unread if it is not discovered by the right readers. Accurate metadata entry can help search engines (including in-store search) rank your book higher. They are ‘in charge’ of displaying your book to more potential readers or to readers with a higher chance to buy your book. The traditional system of book metadata management has changed a lot in the recent years. While metadata standards were created for better management of books, they have started to be seen only for their marketing value. Previously industry-wide accepted metadata standards have become disregarded. Who is to blame for the change? 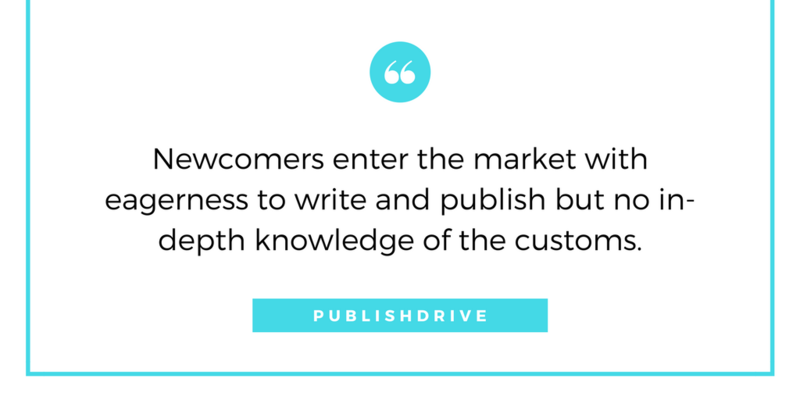 Firstly, many newcomers enter the market with eagerness to write and publish. These people might be talented, but many of them have no in-depth knowledge of the publishing market and customs. Many people just have an idea for a book, the write it up, then try to put the book to the market. It is no wonder they can’t follow the rules and traditions: as a newbie to publishing, metadata management can feel overwhelming. We welcome fresh authors: disruptors bring fresh blood to the industry, new ideas, new ways of doing things. It is exciting to see what the future might bring. But in the meantime, traditional publishers, hybrids and indies operate at the same field, and are using the same distributors. They also have one goal: provide readers with relevant, quality content. While many newcomers have just started to discover metadata, some seasoned hybrid publishers have recently tried everything to get to the top of the search lists. Adding additional or incorrect information in the title, subtitle or series field, including keywords or awards has started to become the new standard. A recent analysis by Mark Williams at TNPS proves that it is not only indies, but traditionally published, even Big 5 books fall into the same trap. Checking the Top 20 bestsellers on Amazon’s list, he shows that 13 of the top 20 books violate Amazon’s own guidelines. In a game like this, eventually everyone loses. Not only other publishers who decided not to join the competition of adding keywords to their subtitle field, but first and foremost the readers who have trouble finding relevant books. The tendency has become so worrisome that BIC (Book Industry Communication) in the UK has recently issued a statement condemning the practice. They point out that adding non-title information in the title or subtitle field is confusing and misleading to readers. It even slows down book management on all levels of the publishing process. 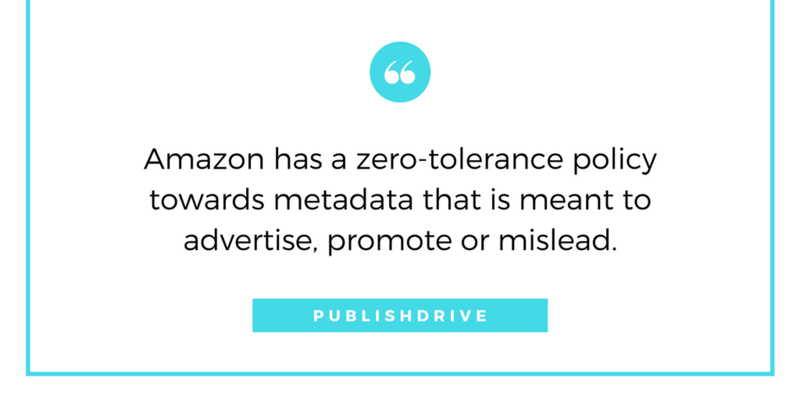 While it is likely that eventually all retailers will follow suit, so far it is only Amazon that had issued a zero-tolerance policy towards metadata that is meant to advertise, promote or mislead. Amazon Content Review team is constantly monitoring submissions by authors and publishers and often flags or disables titles that try to impair readers’ ability to make good buying decisions. You can read KDP’s full metadata guidelines here. While there are regulations regarding all metadata (including regulations on pen names), the most important rules concern titles, subtitles and series names. As titles are the most frequently used marketing tools, the title should only contain the actual title of the book, as it appears on the book cover. The same is true for the subtitle. If no subtitle appears on the cover of the book, you shouldn’t put subtitle in the metadata. Prohibited content includes: special characters (%£^^^), superfluous words, incorrect text formatting, and extra descriptive content (eg. Winner of Booker Prize). Reference to other titles or authors, reference to a trademarked item, sales rank (Best Selling) or promotions (FREE) are also forbidden. It should be obvious, but if the book is not part of a series, series field should be left blank. Series names should adhere to the same guidelines as titles and subtitles. Stay tuned for a detailed analysis of all book metadata fields. Read the next article on the title, subtitle and series fields here.